CX101 is an essential accessory to charge any Qi-enabled device without the use of charging cables. Simply align your device's Qi wireless charging received with the CX101 Qi charging mark at the center of the charging pad. 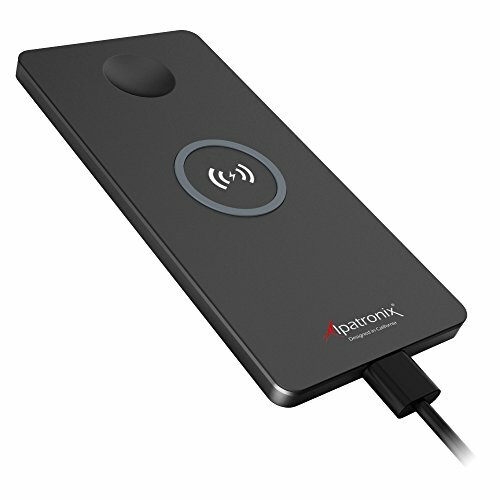 Most Qi-enabled devices have a wireless charging logo indicating the exact position of the wireless charging receiver. Simply align this logo with the Qi logo at the center of the CX101. If your device does not have a wireless charging logo, most likely the wireless receiver is located in the center of your device. Perfect for your home office, work office, night stand and traveling. You no longer have to worry about bringing extra cables along. Apple iPhone X, 8 Plus and 8. Samsung Galaxy S6, S6 Edge, S8, S8 Plus, S9 and S9 Plus. POWERFUL CHARGER & COMPATIBLE WITH ALPATRONIX QI BATTERY CASES: Universal fast-charging 10W output charges Qi-enabled devices and is fully compatible with all Alpatronix Qi wireless battery cases: BX190, BX190plus, BX430, BX430plus, BX440, BX440plus & BXX. Check out the product description for a full list of compatible cases and their ASINs. TWO INTERNAL COILS: Allows for charging in several positions as long as the Qi-enabled device is placed directly on the center. UNIVERSAL COMPATIBILITY & STABILITY: Charges popular smartphone devices such as Apple iPhone X, 8 Plus, 8 and Samsung Galaxy Note 8, S8, S8 Plus, S9 and S9 Plus. Lightweight, compact wireless charging pad stays in place with the non-slip rubber and silicone durable construction. 100% SATISFACTION GUARANTEED: We offer an extended 2-year warranty to ensure long-lasting coverage, power and protection. Don't like it? Simply return it, hassle-free. Package contents include: 1x CX101 wireless charging pad, 1x micro usb cable, 1x extended warranty card and 1x user manual. If you have any questions about this product by Alpatronix, contact us by completing and submitting the form below. If you are looking for a specif part number, please include it with your message.